One of the things that I really like about ASP.Net, is that you can make everything accessible at runtime. 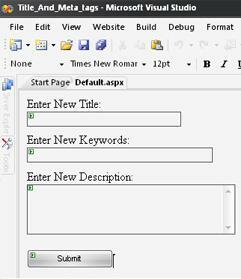 You can make everything dynamic, including set the Title and the Meta Tags of your page at runtime. The good thing about ASP.Net actually, is that you always have the ability to add the attribute: Runat="server" . Using this attribute, you will be able to access your controls at runtime, even for the tags that are in the <head></head> portion of your page (which include of course the meta and title tags, as well as others such as the stylesheets, etc...). So anyway, let's get started. Open up Visual Studio 2005, and create a new website. Give your project any name. In my case it's "Title_And_Meta_Tags" (also, you can download sample Title And Meta Tags Project, used in this tutorial, if you don't want to build it from the beginning). Nothing hard till now. We just set for every tag an ID, and added the runat="server" attribute. This way we can access these controls from the code behind page. Controls IDs: txtTitle, txtKeywords, txtDescription, btnSubmit. title.InnerText = "Initial Title Here"
description.Attributes("content") = "This is the initial text for description meta tag"
This will prove that everything is working fine :) Now there's still a little bit of code to add, to handle the changes at runtime. To do so. go back to your design page, double click on the Submit button to handle the onClick Event. That's it. The new attributes will inherit the text you enter in the text fields. Note that you need to be careful when changing page title and meta tags Keywords and Description, because search engines like Google or Yahoo use them in their search results. Use short title, few keywords separated by comma and short description. All three parameters must suite to the content of page. Hope this tutorial was helpful to you.